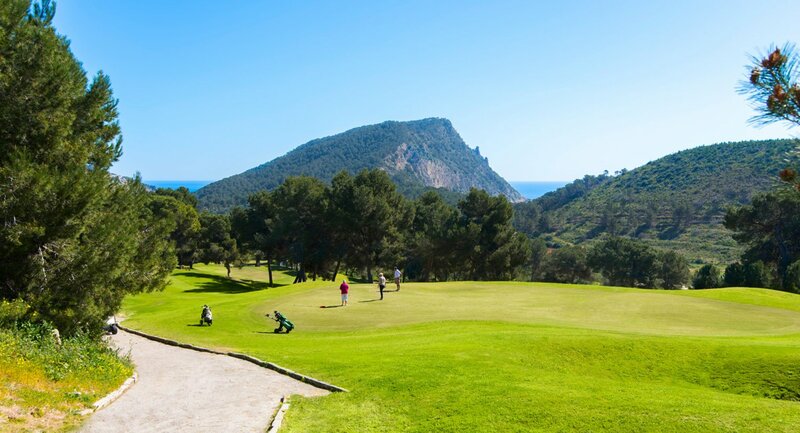 The Golf Ibiza Club, located in a lush valley near Roca Llisa, is open all year offering two golf courses; the 'Golf de Ibiza', a full 18 hole, par 72 course, which is fast and challenging and the 'Roca Llisa' 9 hole, a more relaxing course that allows you to take in the scenery. A driving range and putting green alongside the courses are perfect for warming up before starting your game. Fees are reasonably-priced and cover the whole day, rather than just one round. All the usual facilities are available, including changing rooms, cart and club hire, buggy hire plus there is a pro shop selling golf equipment - all open all year round. Refreshments and snacks as well as a varied menu of Mediterranean cuisine are available at the 'Hoyo 19' restaurant, also open all year. Situated in the Roca Llisa area on the road from Jesus to Cala Llonga, Golf Ibiza lies just 7 km from Ibiza Town and is easily reached by car and boasts ample parking facilities.